When I was in school (many many moons ago….) when kids went on field trips the big yellow bus pulled up and kids piled in. It seemed the norm at every school I went to but now with A in school I’m realizing just how rare it really is! 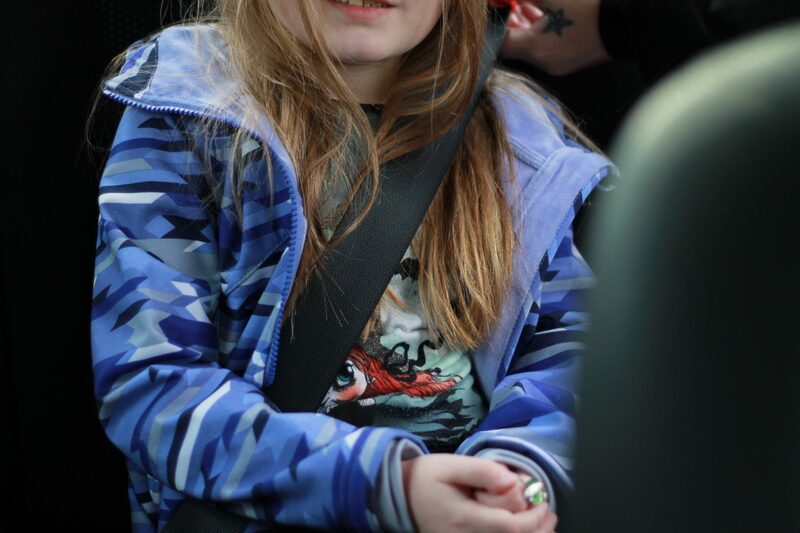 When she started Kindergarten and the parent participation letters came home asking for parent drivers for field trips we were quick to realize just how many kids don’t meet the height and weight requirements to be out of a car seat or booster. You can picture what the hallway at school would look like with parents dropping off giant, cumbersome seats or very well loved booster seats that have been hanging out in grandma’s car for awhile. When mifold showed up on my newsfeed some time ago it was before it was available in Canada and I was curious. 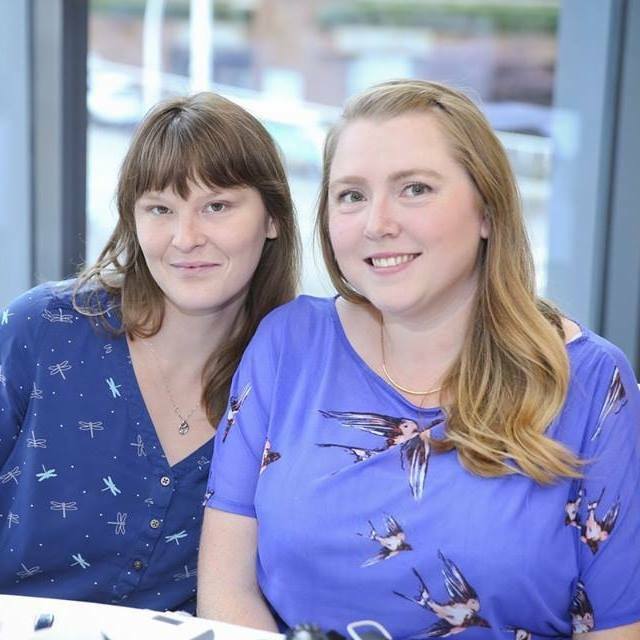 One of the first thoughts I had when I first saw the mifold was likely the same thought many parents have had – How is it safe, with it being so tiny? Admittedly, I had some reservations! 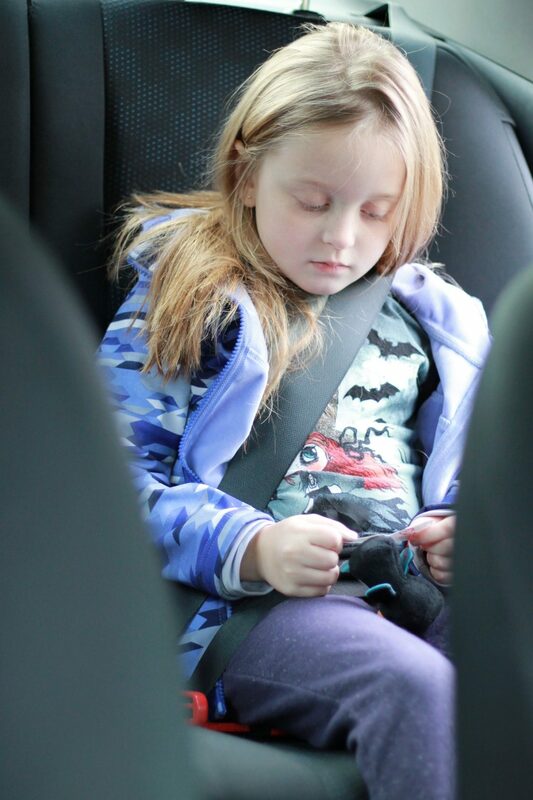 I was excited about the new technology given that booster seat design hasn’t really changed in the past 50 years and curious to check it out but did wonder how it would work with our kids who are at different stages in their car seat “careers”.You can imagine how excited I was when they were approved by Transport Canada as having met the rigorous car seat safety standards here. We had to check it out! 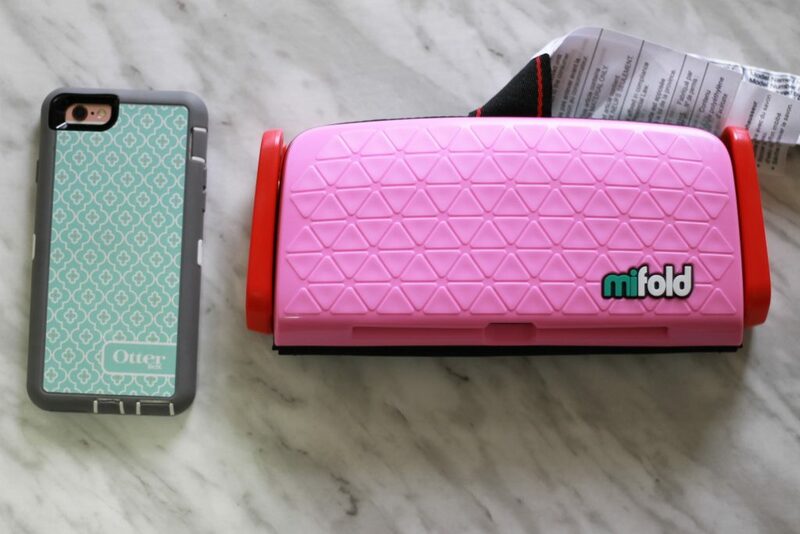 The mifold booster is 10 times smaller than a regular booster seat which is an immediate win for me, I have a tiny car and keeping an extra seat on hand for playdates and the like is really not an option. 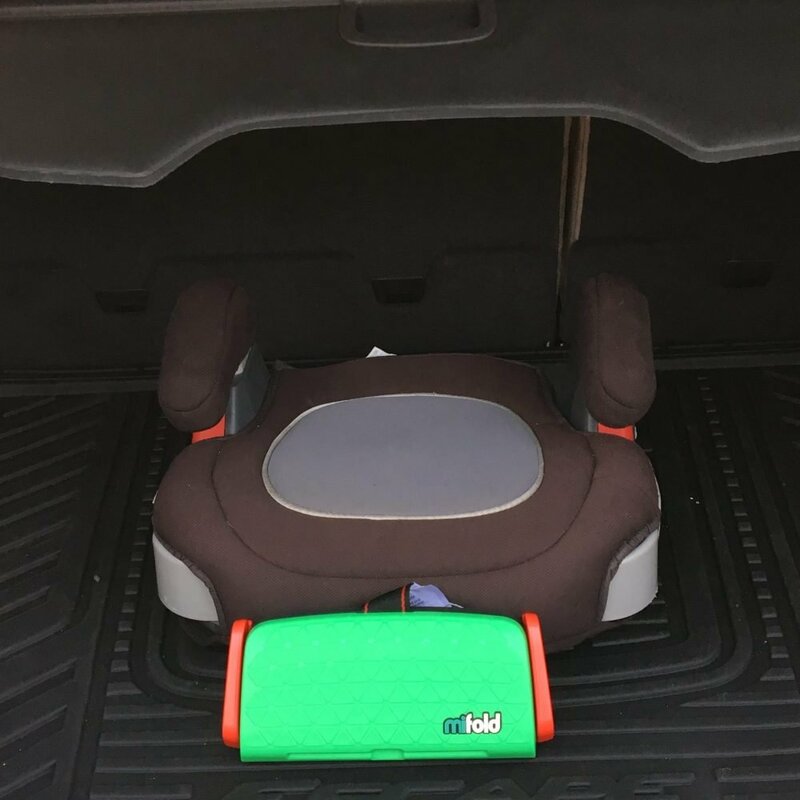 By having the mifold on hand in my trunk, it literally takes up *no* space and can be tucked away under a seat for easy storage when not in use. The compact design doesn’t skimp on comfort though, the easy-clean foam padding adds extra squishieness for little bums. It’s smaller size doesn’t mean smaller safety either, the mifold includes a metal chassis that is made with aircraft grade aluminum and super tough plastic polymer for impact resistance. For field trips, it’s saved us many times! 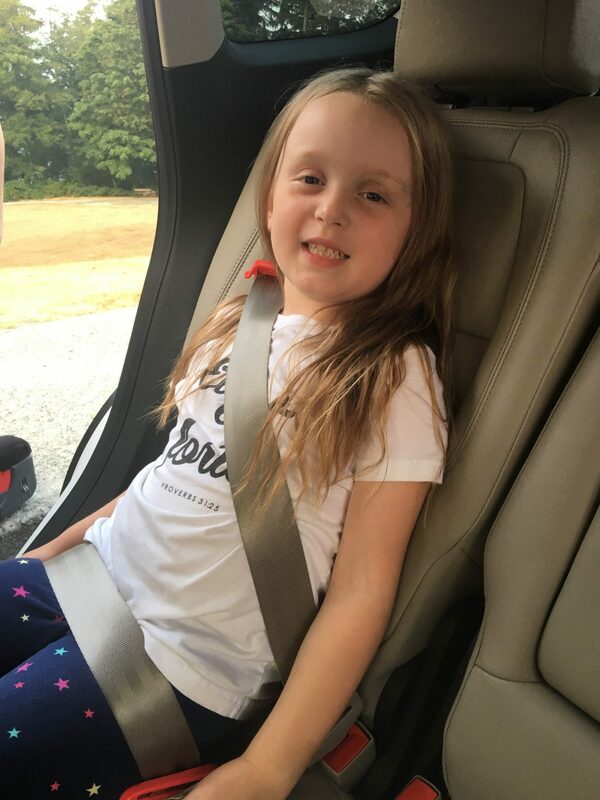 Our 5-point harness seat is very large, very heavy and extremely tricky to install – not something I am willing to trust someone else to tackle, and not something Alivia can carry to the class by herself! The mifold is tiny enough to fit inside Alivia’s backpack and takes up no more room than her lunch kit, it folds up to be 5in x 10in and weighs in at a very reasonable 1.6lbs (about the same amount as a child’s water bottle) and is easy to install with the attached instruction manual that stores inside the seat. I’m confident that Alivia can help with the install on a field trip at this point, as she’s done it enough times on her own! 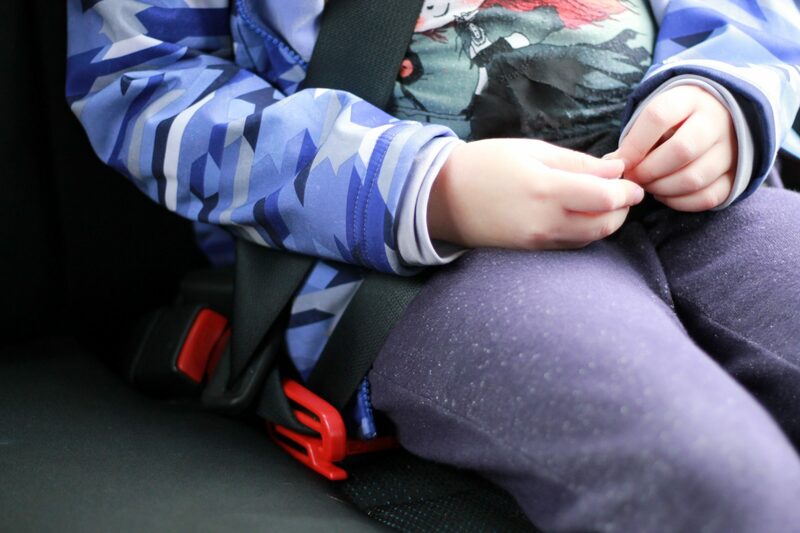 Most traditional booster seats raise kids up to be the same height as an adult, which is supposed to help with proper seatbelt positioning – but this isn’t always the case. Many seats now come with additional seat belt adjusters to make sure the belt is in the correct position but it’s an easily misplaced piece. 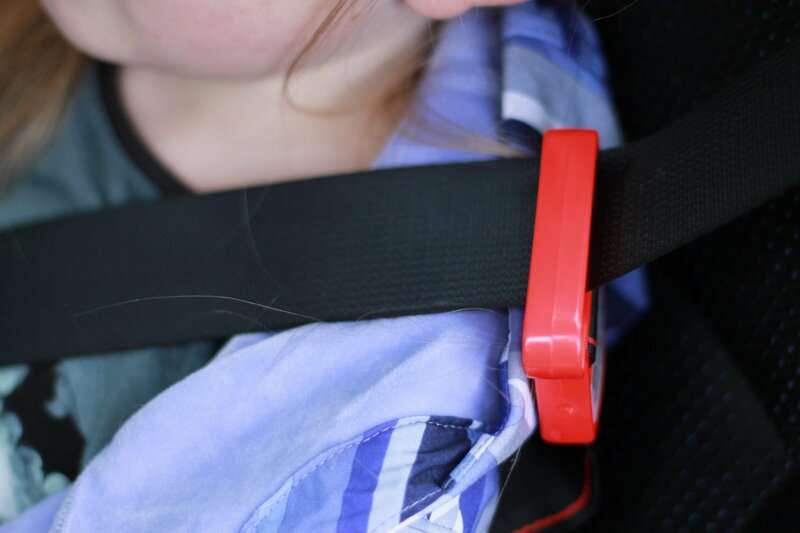 The mifold Grab-And-Go Booster takes the guesswork out of positioning with the attached seatbelt positioner clip that helps bring the seatbelt down to a kid-friendly height, taking the seat belt off the stomach and neck and positioning it across the lap and shoulder. Admittedly, there was some trial and error with the seat for us as we are used to the traditional boosters but once we got the hang of it, it was relatively easy! Our suggestion is to make sure to test out the seat before you need to use it the first time so you aren’t scrambling with the installation. For us, the biggest challenge was getting the seat to lay flat on the leather vehicle seats. We eventually needed to give it a little wedge back so it wouldn’t slide up the back and once it was in place the kids could climb on and be quickly buckled in. We’ve had our mifold seats for some time, they arrived shortly before the flood at our house happened so we’ve had lots of time to test them out and have turned to them many times for field trips, travel, and playdates. They have been super handy and even the kids’ teachers have commented on how much easier it is to manage than the big seats! Full Disclosure: I am the legit crazy car seat mom. I insist on proper installation, maxing out the height and weight requirements on seats before switching to the next level and making sure kids are transported SAFELY at all times. Fact is, you aren’t required in BC to use a child restraint inside a taxi or public transit and honestly, it isn’t possible for many families to transport a full booster everywhere they go daily – but especially now, with the weather changing and the roads unpredictable I encourage you to look into a mifold if your child meets the age, height and weight requirements for use. 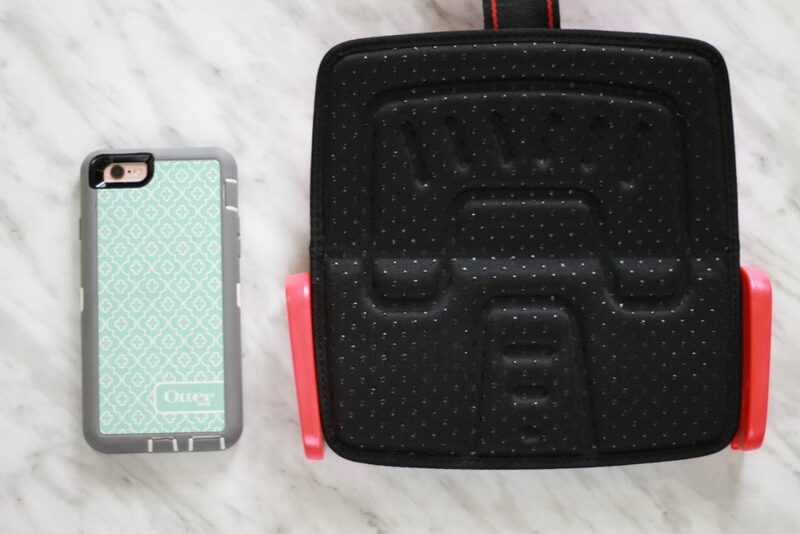 It’s small enough to throw in a diaper bag, purse or backpack and quick enough to install in a taxi so that precious cargo is transported safely. 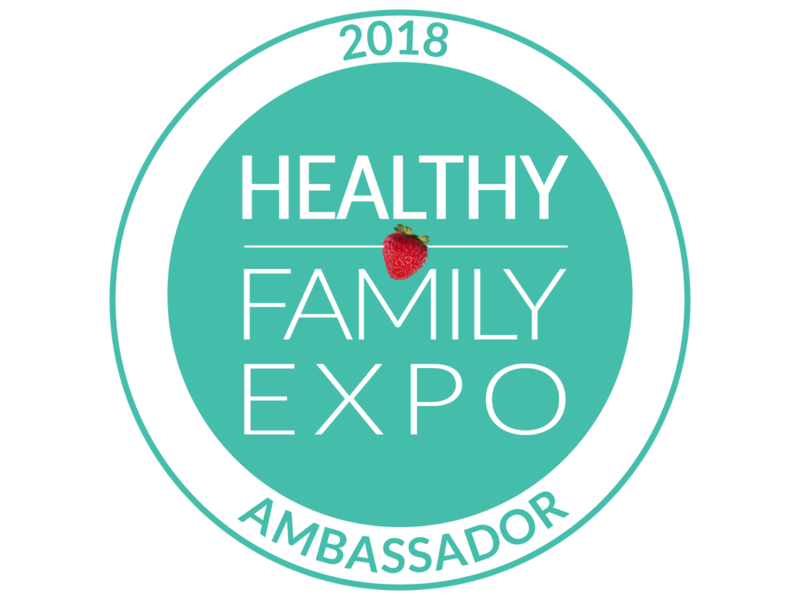 There is tons of information available online about car seat safety, and ultimately families will make the best choice for them. 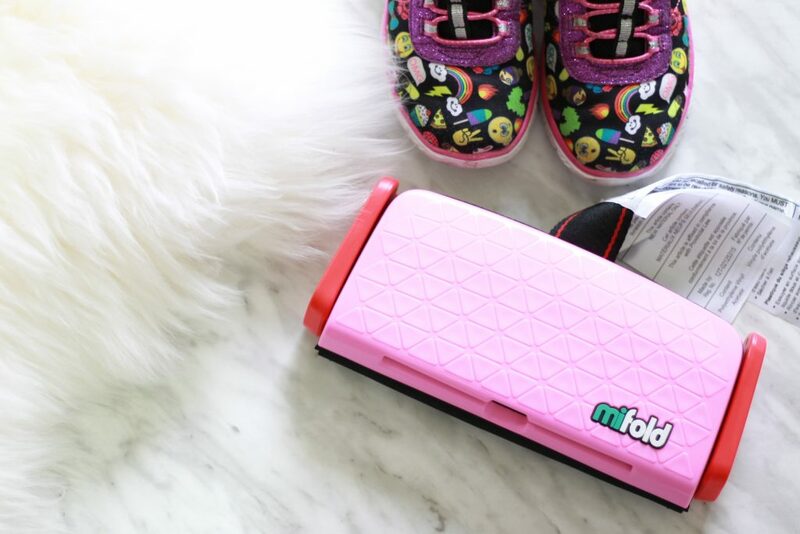 The mifold Grab and Go Booster specifications are safe for children who are at least 4 years old, 40-100lbs and between 40-57 inches. Our personal opinion is that this seat is much better suited to kids approximately 6+ years old who are mature enough to stay seated upright. Overall, once we got through the learning curve the mifold has become something we regularly use, and we could definitely recommend it. 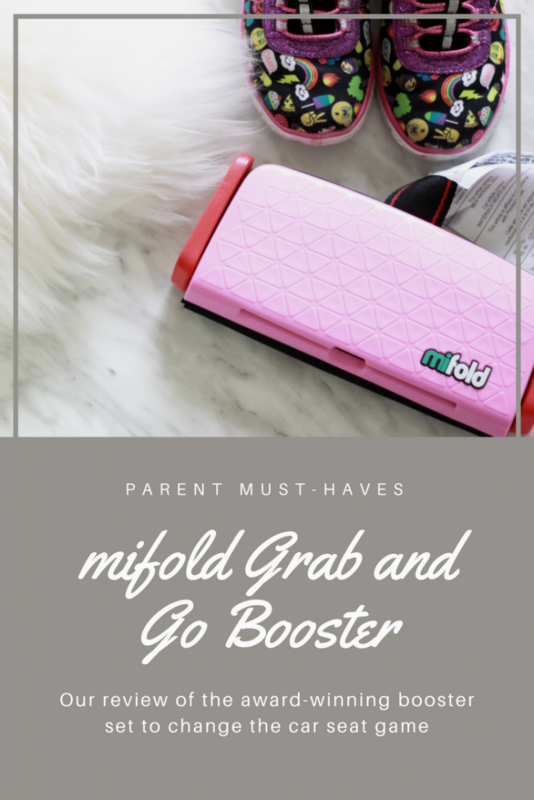 For more information on where to find a mifold Grab and Go Booster in your area, make sure to follow along on Elfe Juvenile Products Facebook and Instagram for info on mifold and many other fabulous kids brands. I might just replace the aging ones I have with a few of these! This looks like the ideal booster seat for Gramma’s (mine) car! Thanks for the review, I’ve been considering getting these but wasn’t sure how ‘safe’ they were.